We are very excited to share the last examples of STEM projects that our MoonBots teams have completed. Teams have worked with their local communities, online communities and around the world! Please help spread the word about these incredible projects. LEGO Aces and their live “Drive a Rover” online program. Iron Reign and their astronaut presentation with a local elementary school. Raider Robotix and their MoonBots Game Day. Molokai Mahina and their public service announcement on local TV about STEM. Q.E.D. and their work with their local YMCA to get kids involved in MoonBots. Lunar Scouts and their work to get other Boy Scouts involved in Robotics programs. Lehi Moonstormers and their Robotics Fair with their local 4-H group and NASA engineers. Lunar Lords and their STEM Outreach Party! 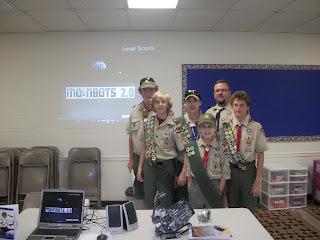 2011 LEGO Odyssey and their presentation at a local robotics camp. Anthem-a-Tronics and their Library LEGO Day! Lunar LEGOBots and their work with the American Museum of Science and Energy.